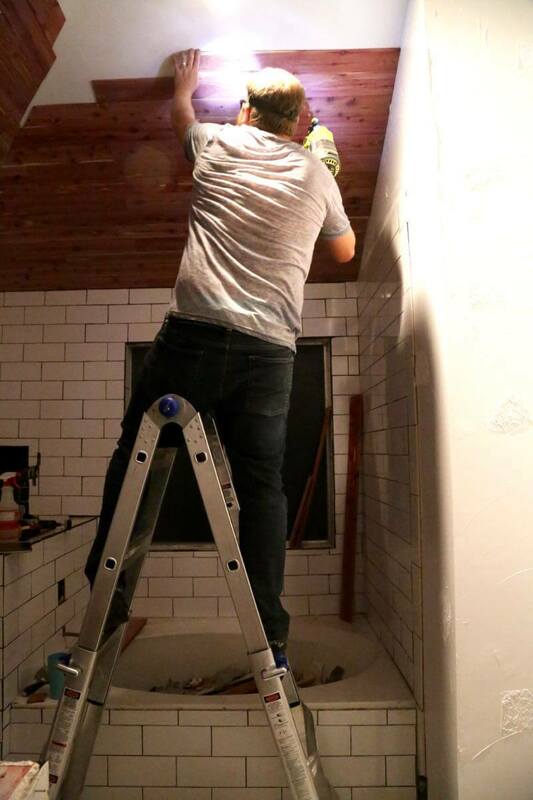 When we started renovating our bathroom, we knew we wanted to come up with a unique bathroom ceiling idea to make our vaulted ceilings look a little more special. We decided to go with a cedar ceiling using tongue and groove cedar planks, and the end result is stunning! I am so excited to share our progress on the One Room Challenge and our DIY bathroom remodel with y’all today. We’ve got a big update in the room and it feels like things are finally, officially coming together and we might actually finish this thing before the deadline! No idea what I’m talking about? Corey and I are currently participating in the One Room Challenge, a 6-week event where bloggers tackle renovating one room. 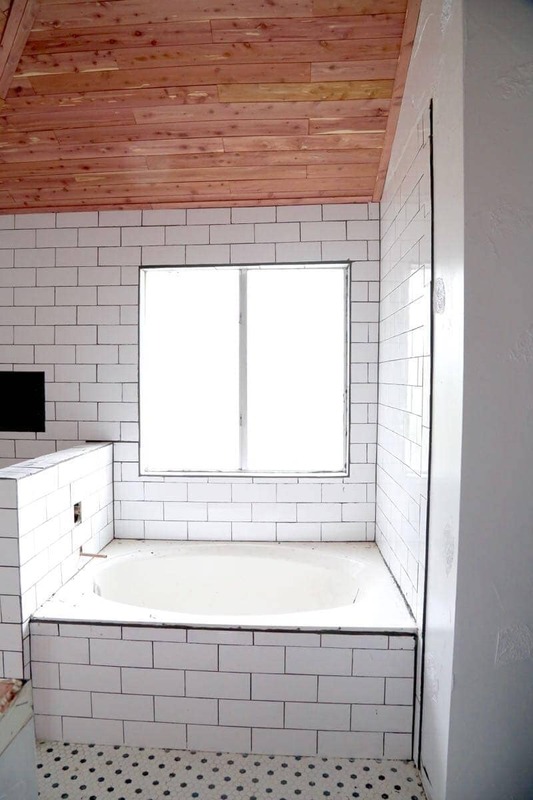 It’s a very “go big or go home” kind of challenge, so Corey and I decided to completely lose our minds and renovate our master bathroom for it. We basically took it down to the studs and have been rebuilding it over the last four weeks. If you need to catch up on our progress so far, go ahead and click through to these posts so you’re all up to date. I’ll wait here for you. UPDATE: Wanna skip right to the “after”? Click here to see the big reveal of our DIY bathroom remodel! You good? 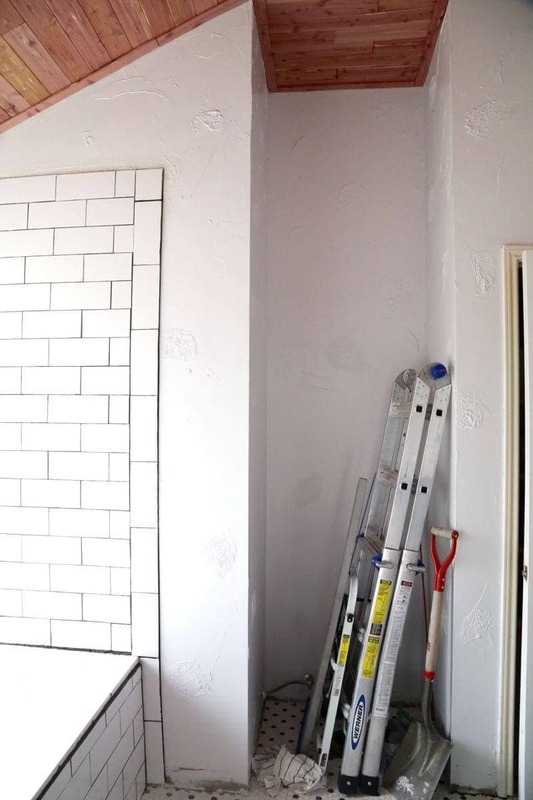 Okay, let’s chat about our week four project: the ceiling. BOOM. I could just drop the mic right there and walk away (because, SERIOUSLY, Y’ALL), but I won’t do that to you. Wanna see another view? Of course you do. Let’s just ignore the fact that we don’t have baseboards yet (working on that this week!) and that the room is still very messy and just look at the pretty ceiling. We got the idea to do these cedar planks on the ceiling when we were at Haven and met the lovely people at Cedar Safe. That weekend was when Corey and I really started talking about participating in the ORC for the first time, so our brains were churning with what we could do in the room. As soon as we got back we shot them an email and asked if they wanted to be a sponsor for the room and, thank goodness, they said yes! They mailed us these planks forever ago and they’ve just been sitting in my house patiently awaiting the day they could make their grand entrance…and finally, here they are. This project was crazy simple and tackled mostly in the evenings while Jack was sleeping, so I don’t have a ton of in-progress photos for you. 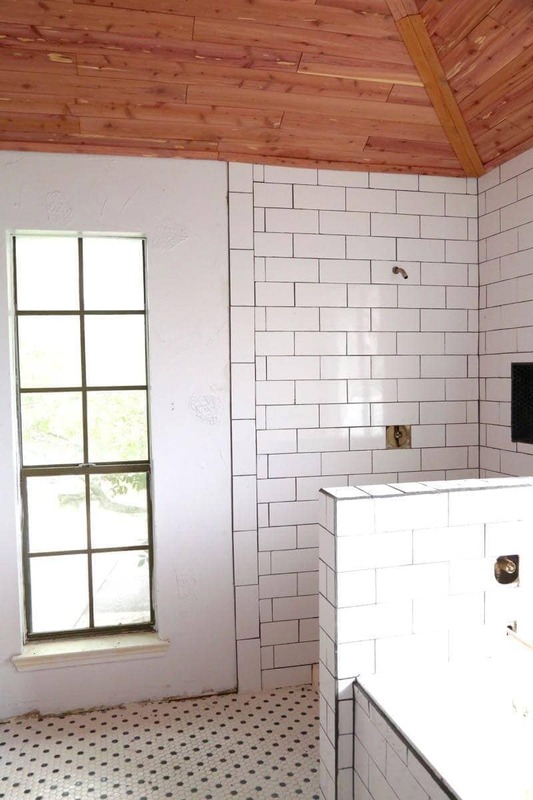 However, I did a pretty detailed tutorial when we installed the beadboard backsplash in our kitchen and this is basically the same idea (except for the part where your neck ends up super sore because you’re looking up at the ceiling for 4 hours straight). We just started in one corner of the room and started nailing – the boards are interlocking so you don’t have to worry about spacing or anything. 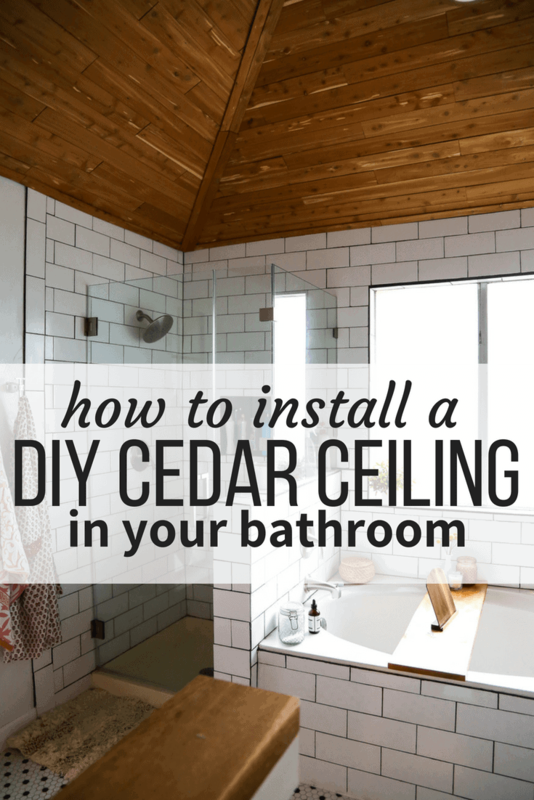 Cedar is pretty durable in wet environments – some people recommend sealing, but we decided to skip that step because, thanks to the super tall vaulted ceilings, this ceiling doesn’t see a ton of humidity or moisture. We’ll keep a close eye on it, though, and if we ever feel like we might need to go back and do it down the line we absolutely will. Oh, and have I mentioned yet how amazing it smells in here now?! Cedar tends to oxidize and change colors a bit as it is exposed to the fresh air, so the color it currently is won’t be the forever color. You can see in the photo below that there was one board we took out of the box right when we got it and it sat around in our room for several weeks – it’s a totally different color than the rest of the boards and I’m totally giddy for the time when our entire ceiling is that color. For now, the room has a bit of a pink-ish cast to it thanks to the ceiling, but I know that will fade over time so it’s no big deal. And, seriously, it feels like a dang spa up in here now. I’m so thrilled with how this project turned out, and I can’t get over how much of a difference it made in the whole feel of the room. I feel like things are finally (finally!) coming together! Of course, if you flip the camera around, things aren’t looking so hot. 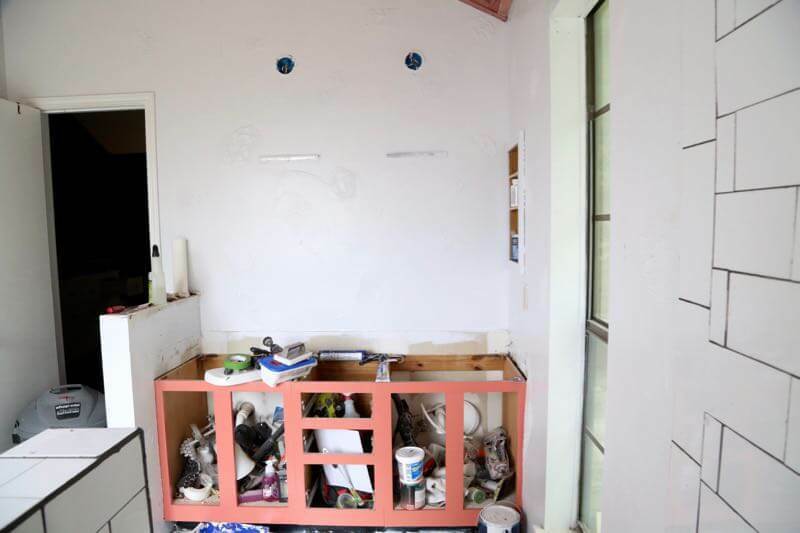 Still no toilet and the vanity area is a hot mess (but, sneak peek of the vanity color!). Next up on our to-do list is installing baseboards, cleaning up the tile, tub, and shower area, tackling the vanity, and getting some lights installed. Oh, and reinstalling the toilet. Because I’d really like to be able to pee in my own dang bathroom again. Hopefully next week I’ll be able to share the shower glass (I’m SO EXCITED to get it installed) and chat about the vanity, then we’ll be able to put all of the finishing touches on in time for the big reveal in two weeks (aaaack!). I cannot wait to see it all come together! 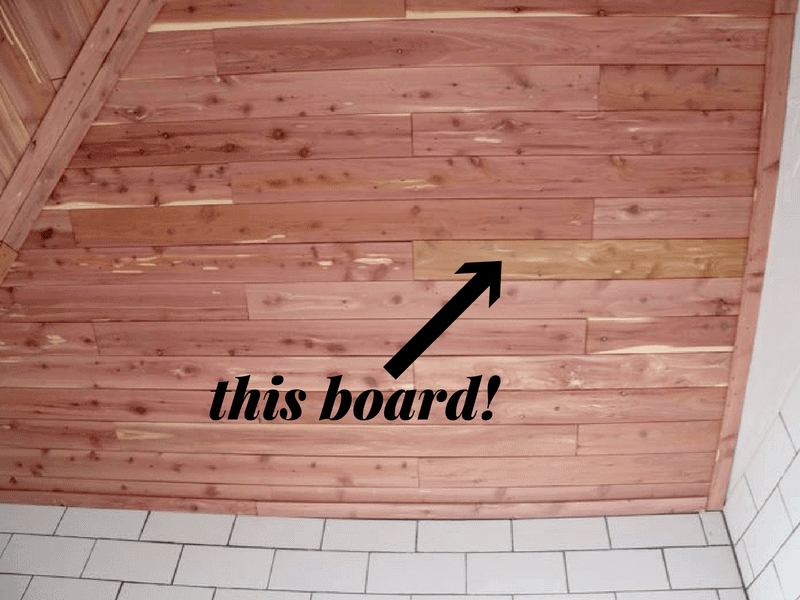 Would you ever cedar plank a ceiling in your house?! I swear, y’all, it smells INCREDIBLE! Hi Dylan – we’ve since moved out of this house. However, we lived there with this ceiling for about a year and a half with absolutely no issues – on the day we moved out it looked just as good as it did on the day we installed it. We’re also getting ready to do the exact same treatment in the master bathroom at our current house. We didn’t seal the ceilings originally, but it absolutely wouldn’t hurt! Your ceiling looks amazing! I’ve always wanted a cedar lined closet, cause they are pretty and apparently good for clothes, but mostly cause they are pretty. Thanks, Kati! I’m tempted to do a closet now too! Wow, the ceiling looks so good! I can only imagine how long that took along with your neck hurting!!! Thanks, Katy! It actually didn’t take quite as long as I expected it to – it goes surprisingly quickly! The ceiling looks amazing and love the dark grout with the tile! Wow, Amanda, I love the ceiling; and I didn’t know that cedar will change colors. That’s a good thing to know. Can’t wait to see the reveal! We are SUPER impressed with your talents and skills! Everything looks fabulous but that ceiling is amazing! Way to go! 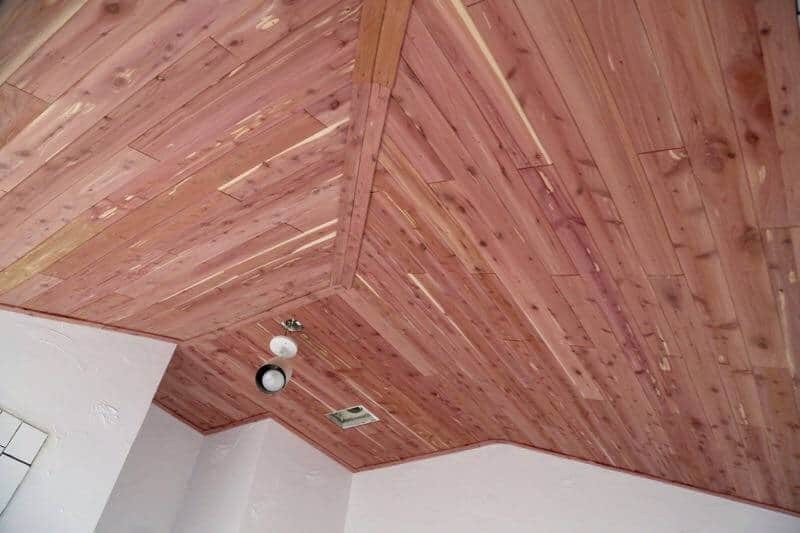 Cedar on the ceiling is SUCH a great idea! I bet it does smell amazing!! Everything is looking fab so far! This is gorgeous! I love the mix of all of the white tile and the dark wood, so beautiful! Oh. My. Goodness! That ceiling is incredible!!! I would totally be in there staring at it all the time. This bathroom is going to be so gorgeous when it’s all finished. I LOVE what you did with the ceiling, amazing! This bathroom just keeps getting better and better! So looking forward to the reveal Amanda! Oh wow – that is GORGEOUS! I bet it smells unbelievable. Pinning! I love the ceiling with the tile so much! Such a pretty space. Nothing wrong with a pink glow! Looooooks amazing! Congrats on such a big project! That ceiling is to die for! The wood really warms up the space. Love it! Omg, I can’t even tell you how much I love this!! The ceiling! The tile! This room is looking sooo good! Um this is amazing! 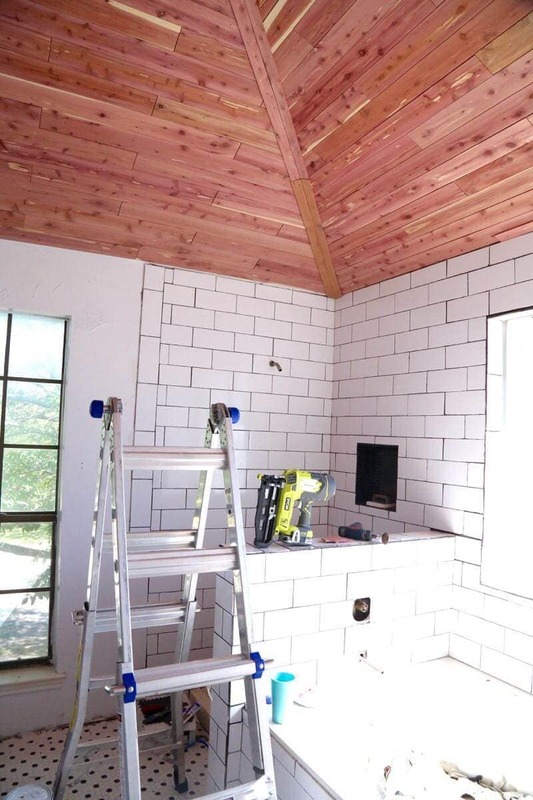 That ceiling is bomb and I cannot wait to see the finished product. holy moly, this is awesome! we used cedar safe and i love their product! your bathroom is epic! i am hoping to redo ours one of these days and this is a great idea! Thank you, Cassie! It really is an awesome product – I love it! You guys are doing some mad work over there! Lots of progress this week for sure. Coming along nicely! WOW! That’s all I can say. WOW! The cedar looks beautiful with all the tile and white. What a fabulous idea to add the cedar planks, Cedar goes so well with white and all this is going to be swoon worthy! I have the cedar planks too from Haven. I created a cedar closet and i used a white fluffy rug and the two combine are great! Yay!!! The cedar plank ceiling is looking awesome. Lol at the “sore neck” comment. Bet it was tough to hold the planks above and all! Can’t wait for next week’s update! It was definitely tedious – but so worth it! WOW! I can’t even recognize this space anymore. Amazing transformation already! Thank you! I was looking at an old photo the other day and it’s so crazy how different it’s looking! Hello! We are installing a cedar ceiling next week in a tiny house. There will be a claw foot tub, ceilings are 12 foot. I was wondering if you had decided to seal the cedar. I would prefer not to but don’t want the cedar to turn gray. Thank you for this post, amazing job! Hi Denise – Thanks! We did not end up sealing it and we didn’t have any issues. We recently moved out of that house but lived with the cedar ceiling unsealed (and took showers/baths daily in that bathroom) with no issues for just over a year.